Brooks Malone is excited to offer top-of-the-line fiberglass swimming pools from Blue Hawaiian, a great option within our product and service lineup. There are lots of great reasons to select a fiberglass pool. You’ll be able to choose from a big variety of layouts including long lap pools and organic-shaped lagoon pools. Fiberglass pools can include built-in features like seating nooks and staircases. Fiberglass pools also offered streamlined installation so you’ll be relaxing in your new pool quicker. Even better – there are lots of ways to save money with a fiberglass pool. We are a full service construction company able to offer grading, excavation, installation, hardscaping, landscaping, plumbing, electrical, pool cabanas and more to complete your backyard paradise. 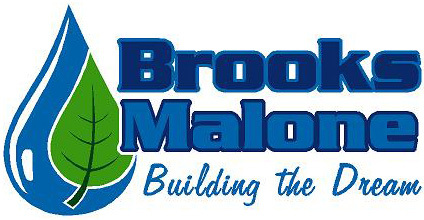 Brooks-Malone is licensed and insured as a general contractor by the state of Tennessee. Call us today for a free estimate at 423-638-9164, and we’ll see you through start to finish. Satisfaction guaranteed! The pools are factory-built and freighted to your location for our installation team. This type of pool thus has some limitation on dimensions. Please keep in mind we also offer custom liner pool construction if you don’t see the fiberglass pool layout you are looking for. Take a look at all the great fiberglass pool models we offer and find one you love! Here’s a great fiberglass lap pool we installed in 2015. This project included a huge outdoor living area, beautiful tile work in and around the pool, gorgeous contemporary entry railings, a diving board, and built-in entry steps. Another backyard paradise achieved right here in Northeast Tennessee. Here’s a great fiberglass pool project we completed recently at a very reasonable price. It featuring a nice molded stair entryway, decorative tile border, tanning ledge, and lots of patio space for poolside lounging. This total backyard remodel included a durable and metal fencing system and low maintenance landscaping options.